Cork Eye Clinic are proud to offer a new, in-office procedure for the treatment of blepharitis. Blepharitis is an inflammatory condition affecting the eyelids and eyelashes. Common symptoms of blepharitis include dandruff like flakes, redness, sandy feeling, burning, itching and a sticky sensation in the eyes. If Blepharitis is left untreated, the eyelid glands can become clogged and infected. This can cause styes, dry eye syndrome, corneal ulcers and unsightly crusted scales and debris on the eyelids. 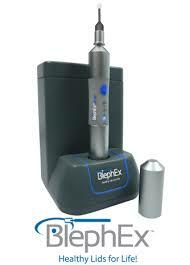 Blephex improves the overall health of the eyelid and reduces many of the common symptoms associated with blepharitis. During a Blephex procedure a soft, medical grade sponge is moved across the eyelids whilst it spins to effectively remove debris and bacteria from the eyelids. The procedure takes approximately 10 minutes. Prior to treatment a numbing drop is placed in each eye to allow maximum comfort. Similar to a dental hygienist removing plaque, Blephex gently unblocks the meibomian glands, removing the debris for clean, clear, comfortable eyes. Demodex are parasitic mites living in and around the hair follicles thriving on the biofilm build up. They block follicles and increase eyelid inflammation. Blephex effectively removes their food source and helps deal with an infestation. Why Have The Blephex Treatment? Blephex can save patients money and time. It ensures a completely clean eyelid margin which is easier for the patient to maintain. Patients report that the procedure is easy to tolerate, stating that most felt a tickling sensation. Patients also reported that they are happy because the irritation and discharge is gone. They also report that taking care of their eyelids afterwards at home became much easier than before. While home treatments are effective removing some debris, it is difficult for patients to completely clean their eyelids initially to a high level. As with regular dental cleanings, Blephex treatment should be performed every six months to maintain the health of the eyelids and control over Blepharitis. My son David has been a patient of Mr. Golchin's for 5 years with an on-going, often aggressive eye problem. Without exception Mr. Golchin has always been a pleasure to deal with. He always addressed both David and I in all consultations as individuals and as a family. This has been very important particularly when David was younger. Parents don't like seeing their children unwell so a supportive Doctor is a huge asset. We have had to make some difficult decisions regarding David's treatments over the years and Mr. Golchin has always been honest and expert in these treatments including a few operations over the years. We wish him all the best in his new consulting rooms.